Having a food allergy or an intolerance can be tough. Overnight, you become a sleuth, researcher, and all around expert on what foods have the ingredients that won’t work well for you. And most of the time, that also means turning down some of the favorite, common, or easy to find foods you used to love or just take advantage of (I’m looking at you, bread). With the increasing amount of food allergies and intolerances, the more and more people are becoming aware, labeling foods, making versions of foods free of a lot or most allergens, and creating more allergen friendly ways to cook some of those favorite foods that are now off limits. I heard about Debbie Adler’s latest cookbook, Sweet, Savory & Free: Insanely Delicious Plant-Based Recipes Without Any of the Top 8 Food Allergens earlier this year and I got so excited. I could easily cook anything in this cookbook and know that I could enjoy it and make it for other people with the same or different food allergies. All of the recipes in this book are gluten, egg, dairy, soy, peanut, tree nut, fish or shellfish free. They’re also vegan, meaning that if you’re a vegetarian and looking for more meatless recipes in your life, you can get a lot of use from this cookbook. This cookbook is broken down into staples, then by the kind of meal (breakfast, lunch, pastas, entrees, and yes, even bread). The kinds of recipes hit the spot for the foods you’ve probably been craving, but with an allergen-free twist. Some of the allergen-free swaps are brands she recommends, and others are ones that you make. She’s got a pantry list in the front, as well as a great resource list the back for store-bought ingredients that are allergen friendly. One of the things I never got too deep in before becoming gluten-free was pasta. I knew there were so many different kinds, shapes, sizes and techniques, but it always felt like something I could always try, since pasta is so ubiquitous wherever you go. Now that I am gluten-free, there’s a certain trepidation on even entertaining the thought of going to an Italian restaurant where pasta is the name of the game. Debbie’s book has an entire section on pasta and other usual glutened out foods like pizza and noodles. I wanted to give gluten-free pasta a try to see what it would be like. I made the Yam Gnocchi with Sriracha Pesto because I love yams and sweet potatoes. The swaps and workarounds for the allergens in these books is real food, which I appreciate. The Yam Gnocchi was easy to make (considering the fact that it is pasta after all) and would be perfect for a weekend night meal for the family or to entertain. 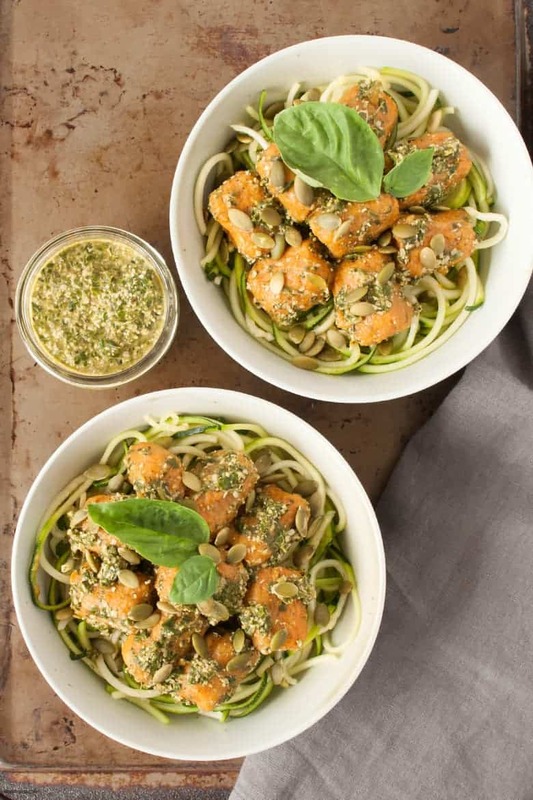 The sriracha pesto brought a new twist to the dish, which is a common theme throughout the cookbook. There’s a nice variety of cuisines in this book, which as someone who loves trying new cultures through food, I enjoy. The Gnocchi was also wonderfully filling. The fiber in the yam made it heartier than most wheat pastas I’ve had. I paired it with zoodles to add even more vegetables and non-pasta pasta goodness. All in all, I enjoyed seeing the possibilities of cooking without the top 8 allergens. I foresee making a lot of these recipes as the holidays come up, where more and more gatherings with people with all sorts of dietary needs happen. You can find Sweet, Savory & Free: Insanely Delicious Plant-Based Recipes Without Any of the Top 8 Food Allergens on Amazon, Barnes and Noble, or a local bookstore. 1. To make the gnocchi: Add the yam to a medium pot of boiling water, lower the heat, cover the pot, and let simmer until fork tender, about 9 minutes. 2. Drain the yam in a colander. When the yam has cooled a bit, peel off the skin and grate the yam into a large bowl. Grating lets air into the yam, making for lighter gnocchi. 3. 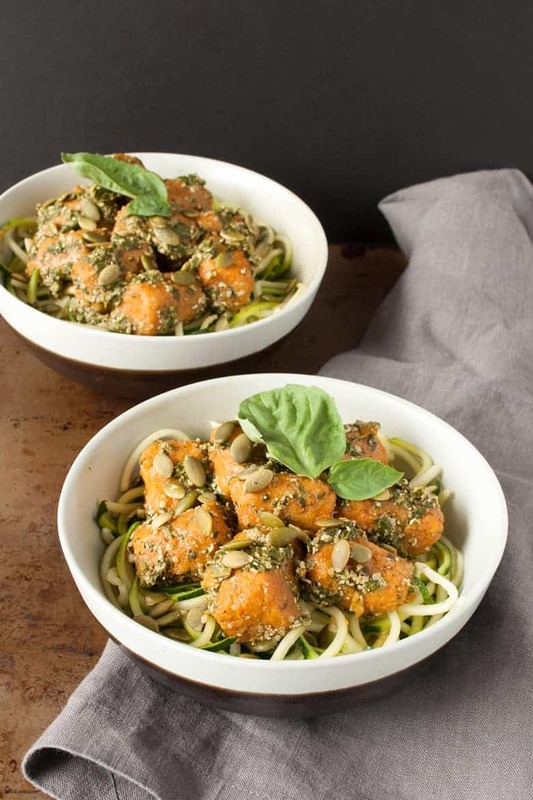 Whisk together the ground pumpkin seeds, tapioca flour, garlic powder, nutmeg, salt, and black pepper in a medium bowl. Add the grated yam to the flour mixture and stir to combine. 4. Divide the yam dough in half. 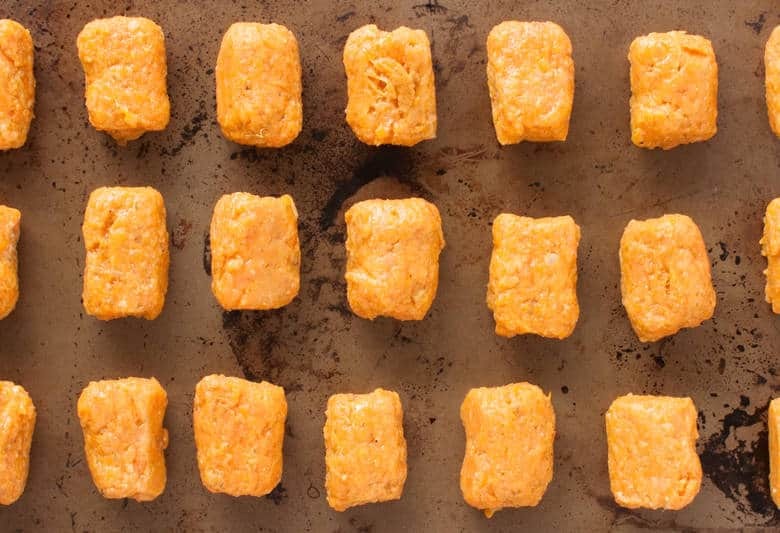 Roll out one half of the dough into a 14-inch rope and then cut it into 1-inch pieces. Repeat with the remaining dough. 5. To cook the gnocchi, fill a medium-size pot with water, place over medium heat, and bring to a boil. Add half of the gnocchi to the water. Stir to prevent them from sticking to the bottom, and remove them with a slotted spoon after they float to the top, about 3 minutes. Repeat with the remaining gnocchi. 6. To sauté: Place the gnocchi immediately in a medium sauté pan over medium heat. Add the broth and simmer for about 1 minute. 7. Spoon the gnocchi into bowls. 8. 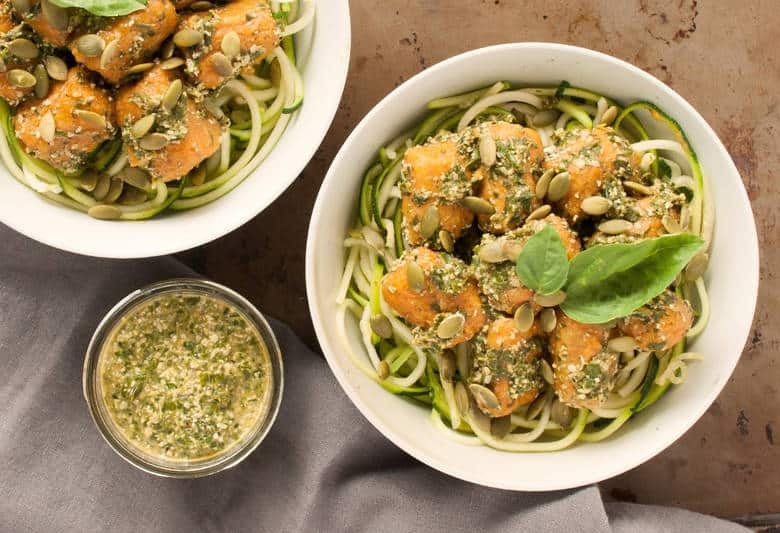 To make the pesto: Add the basil, hemp seeds, lemon juice, Sriracha, and salt to a food processor, and pulse until the mixture comes together. With the machine still running, drizzle in the water, 1 tablespoon at a time, until the pesto is smooth. 9. To serve, heat the pesto and pour over the gnocchi. Recipe reprinted from Sweet, Savory and Free: Insanely Delicious Plant-Based Recipes without Any of the Top 8 Food Allergens by Debbie Adler with permission from BenBella Vegan.